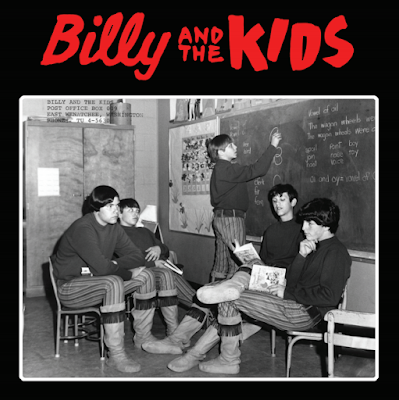 Here are the kids from East Wenatchee (WA), who recorded two fabulous 45s on the Julian label. If you are unfamiliar with the ‘Back From the Grave’ LP series, the B-side of their first single, ‘Say You Love Me’ will knock your socks off. It’s the first effort recorded by these junior high school musicians, aged between 12 and 13-years-old! It’s got everything you would expect; a solid drum beat, desperate teenage love-type lyrics with high-pitched screams and a great guitar solo. In 1964, under the Beatlemania spell, twins Bill and Bob Burns decided to learn an instrument. Bill started to practice the guitar and Bob took drum lessons. Soon after, some of their schoolmates joined to form a band, and their mother, Jean Burns baptized them ‘Billy And The Kids’. In the beginning it was: Mike Rice (vocals), Russ Wagner (bass), Bob Gourlie (lead-guitar). A year later, Bill switched to the bass, and Ken Laymance took the rhythm guitar to complete the definitive line-up for both 45s. Their dad, Ollie or ‘Jolly Ollie’ as he liked to be called, worked as a Chief Juvenile Probation Officer in Douglas County. His interest in working with young people was a perfect fit when he started promoting dances and concerts. He was very supportive of the musical ambitions of his boys and he made a point to book Billy and The Kids as an opening act for such bands as The Kingsmen, The Sonics, The Wailers, Don And the Goodtimes, and Paul Revere And The Raiders. He also promoted nationally-known acts like The Shindig Show, The Strawberry Alarm Clock, Mitch Ryder and the Detroit Wheels, The Knickerbockers, The Standells, The T-Bones, etc. Always ahead of the game, Mr. Burns had the perfect idea and encouraged the band to use the dynamic go-go dancer Pam Cartwright for their gigs. The band never failed to get a warm audience response. The girls liked the band and the guys sure liked Pam. The band gained so much experience that Mr. Burns introduced them to veteran Wenatchee disc jockey Don Julian Bernier, of the local radio station KMEL. At this time, Don took advantage of the beat craze and recorded local artists and bands like The Chargers, The Talismen, The Aztecs; 11 artists in total. ‘It’s Not the Same’ b/w ‘Say You Love Me’ (J-104) was released in June 1965. The A-side is a bittersweet break up love song which went to #1 for four weeks on KMEL Radio! 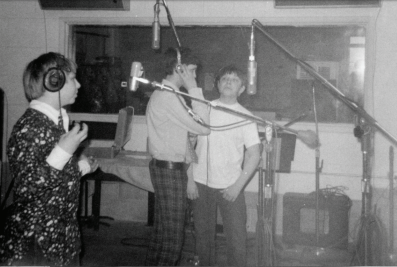 In 1967, they were back in the studio to record ‘When I See You’ b/w ‘Do You Need Me’ (J-109), and this time the A-side was a total hurricane, punctuated with a dramatic chorus. On the flip side the kids show their ability to perform an excellent folksy ballad with very well mastered vocal harmonies, reminiscent of the early Byrds. The bands musical progress can be heard on the second single and can be attributed to the band practising as much as they could. Ollie Burns, who was so proud of the band, never missed an opportunity to put the group on the bill, side by side with the finest bands of the area to keep them busy. It wasn’t unusual that Bill and Bob asked for chords and musical help from the bands that their dad hired to play at his dances and private parties. Soon Billy and The Kids’ touring territory extended to Washington, Oregon, California, and Montana. 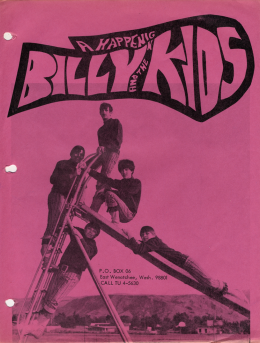 A fun and memorable date was when Billy and The Kids played at the 67’Teen Fair at the Green Lake Aqua Theatre in Seattle; headlined by The Vanilla Fudge and Sony and Cher. Both 45s are original material, but their set list included a selection of their originals with the hits of the day from the likes of James Brown, The Kinks, Beatles, Rolling Stones etc. As they got older, they didn’t want to be called kids anymore, so they changed the name of the band to ‘Double Image’, a reference to Bill and Bob looking identical. The group lasted until 1972 and had some line-up changes including Loren Bolinger (Talismen), Steve Nelson (Chargers). Over the years the Burns brothers continued to pursue their interest in music. They had an international release with Meredith Brooks in the 80s. They released a CD in 2008 The Called (original Christian music). Their whole journey could sound a bit like a fairy-tale for these youngsters, but everything is real, thanks to the dedication of their father, who incidentally, became one of the main promoters in the Northwest; working with hundreds of cool bands during the 60s, and possibly with thousands of bands during his career. Without the interest of Don Julian Bernier, a true pioneer and music lover, giving a voice to the local talents of East Wenatchee area, their bands’ journey may have been much shorter. Once again, the Swiss folks at Feathered Apple Records hit the spot with a double-whammy reissue. It offers well-researched liners made with the main players of this journey, previously unseen photos and a top-notch remastered sound. The cherry on top is that two of the songs ‘It’s Not the Same’ and ‘Do You Need Me’ see the light for the first time in 50 years!